Perimeter fencing is a convenient and cost effective means of protection, from dangerous rotating machinery and equipment. It provides a physical barrier which can include various access points for operator / maintenance personnel. These can be hinged or sliding doors, or hatches which can be fitted with safety interlock switches for access control. Height and distance from the hazard is dictated by regulation. The standard of build is varied to suit the environment. Heavy Engineering usually requires heavily built barriers and access points. 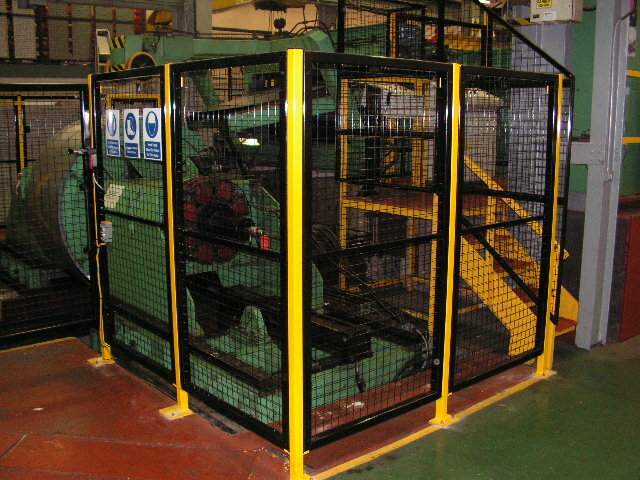 Solon Systems will survey the machinery and provide fencing solutions that are both practical and cost effective. For most applications, standard modular fencing panels, posts and doors are suitable and a very cost effective means of protection. Usually available from stock. Solon Systems will design, manufacture, mechanically install and electrically integrate.